View of St John the Baptist Church, the parish church of Dronfield in Derbyshire. It was the centre of an extensive parish and was one of the richest livings in Scarsdale. The building is of dark grey stone. It has a tower and spire in the Gothic Perpendicular style. 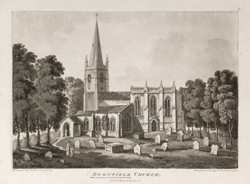 As can be seen in this print, the chancel was taller and more ambitious than the rest of the church.